There are still a number of important midterm races that have yet to be decided, but already the political press is ready for the 2020 presidential race to begin, because politics is a big game and it's just no fun for the pundits if there's not a horse race going on and nobody learned anything from 2016. Matthew Choi at Politico: Biden Says It Would Be 'Too Early' to Announce a Presidential Run in January. Sabrina Eaton at Cleveland.com: Sen. Sherrod Brown of Ohio Is Weighing a Presidential Run. Staff at WTHR: Former Starbucks CEO Howard Schultz Possibly Considering Presidential Run. [Content Note: Video may autoplay at link] Staff at WIVB: Kirsten Gillibrand Considering Presidential Run in 2020. Brett Samuels at the Hill: NY Governor Andrew Cuomo Non-Committal on 2020 Presidential Run: 'I'm Focused on the Governorship'. Chris Cillizza and Harry Enten at CNN: Why Kamala Harris Is the New Democratic Frontrunner. Chris Cillizza at CNN: Here's Why Hillary Clinton 4.0 Is a Terrible Idea. Jake Flatley at WV Metro News: Ojeda Makes His Presidential Run Official with D.C. Announcement. So, one state politician with zero chance has announced his candidacy, the political press continues to clamor for the same old politics which got us into this mess, and Chris Cillizza is still the biggest Hillary hater in punditry. Meanwhile, here's something amusing I read over the weekend by Will Bunch: Can 'Minnesota Nice' Trump Manhattan Mean? The Case for Sen. Amy Klobuchar in 2020. Now, you know how I feel about drafting campaigns (I HATE THEM), especially aimed at female candidates, but I will confess that for awhile I have been privately pitching to the other mods the same idea that Senator Klobuchar would be the strongest Democratic candidate, sheerly because of the stark juxtaposition she cuts against Donald Trump. 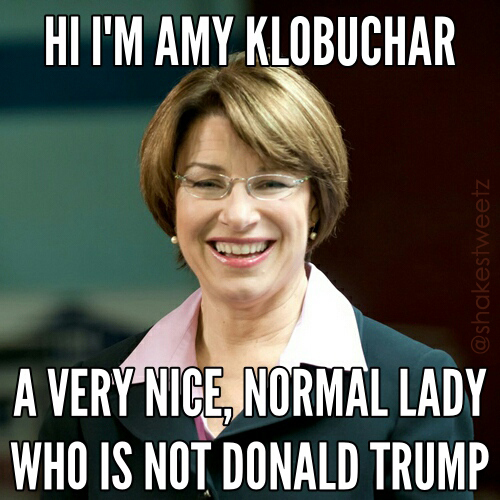 The Democrats' best chance of winning in 2020, if there's any chance at all, is to just stand Amy Klobuchar on a debate stage and have her say, "Hi, I'm Amy Klobuchar, a nice and very normal lady from the Midwest. And I'm not Donald Trump." I even made her first campaign poster, should she want to run! Senator Klobuchar has a lot of terrific qualities that would certainly make her an excellent president if she wanted the job, but the not being Donald Trump part would be a very fine place to start her campaign.